Styling On A Budget: Do These Look Familiar? Recognize this shoe? 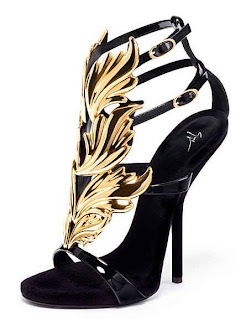 At first glance it looks like the $1,625 Giuseppe Zanotti and Kanye West 'Cruel Summer' sandals...but it's not! This is actually the Zigi Soho Barette shoe sold at Bakers. The shoe retails for $149.95.This shoe is from the Giuseppe Zanotti and Kanye West collaboration for the Spring 2013 collection. Celebs such as Khloe Kardashian and Adrienne Bailon have been seen rocking this shoe. The shoes look very similar...definitely Styling On A Budget!